The frontier of functional and mechanistic enzymology. (1) Free-radical mediated enzyme catalysis (radical enzymology). (2) Cofactor biosynthesis in humans and pathogenic bacteria. (3) Antifungal biosynthesis and genome mining. 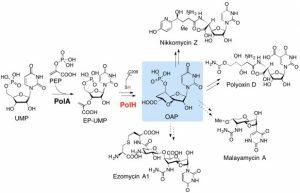 (4) Fungal cell wall biosynthesis and antifungal mode of action. We use a combination of approaches from organic chemistry, biochemistry, molecular biology and spectroscopy with a particular focus on functional and mechanistic characterization of enzymes, small molecule characterization, bacterial and fungal/yeast genetics, synthetic organic chemistry, NMR, EPR and fluorescence microscopy. Haoran’s Methods in Enzymology paper was published. Yokoyama Lab is powered by WordPress at Duke WordPress Sites. Please read the Duke Wordpress Policies. Contact the Duke WordPress team.